Overdriven Reloaded has so much going for it I'm tempted to just copy/paste a bullet point list of its features, make a lame pun about "bullet" lists for a shooter, then tell you to go play it. The remake of the classic Overdriven has six game modes, four levels of difficulty, hidden alien artifacts to find, co-op for up to four players, gameplay that mixes puzzles with reflex based action, and space cows. Even if you're not much of a vertical shmup fan, this game's got something to make you happy. 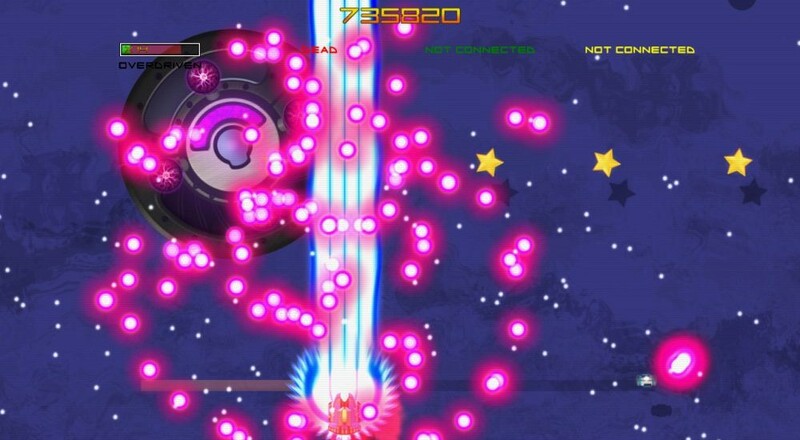 Overdriven Reloaded is a vertical scrolling shmup reminiscent of old arcade games. You pilot a ship, surprise surprise, flying through half a dozen locations that are all packed to the edges with enemies and bullet patterns ready to end your day. The key to survival is not getting hit. Not getting hit means threading your sprite through moving gaps barely big enough to fit through, making you feel like a total badass every time you pull it off. While you're trying not to die you'll be dishing out an appropriate level of death to the things shooting at you. Overdriven Reloaded is the kind of shmup where you'll be holding the fire button constantly, spraying bullets in places that may or may not have enemies in them, just because they might show up. 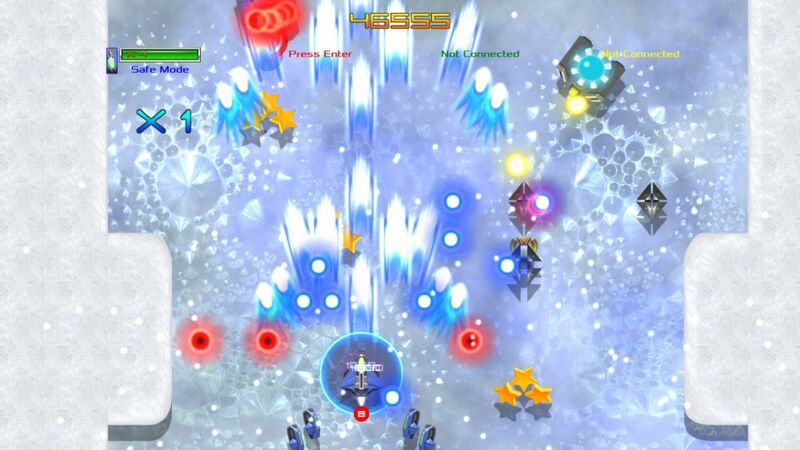 Your gun upgrades as you collect power-ups, turning from a small shooter to a multi-directional blasting powerhouse. You've also got an overdrive shot, which unleashes a focused beam that does major damage at the cost of temporarily lowering your health. Big risk, but big gains. Defeated enemies drop all kinds of items, everything from health packs to points stars and screen-clearing bomb refills. The basic idea is to kill the things that might kill you, avoid touching the bullets, and run into everything that looks semi-useful. Build up a reservoir of stuff for the mega boss battle at the end of each level. You'll need every ounce of firepower you can get to take down these big ships. Rounding out its basic features, Overdriven Reloaded comes with a basic story mode, level specific arcade mode, healthbar-free manic mode, boss rush, challenge levels, and more than four dozen puzzle maps. Yes, puzzles, in a shmup. 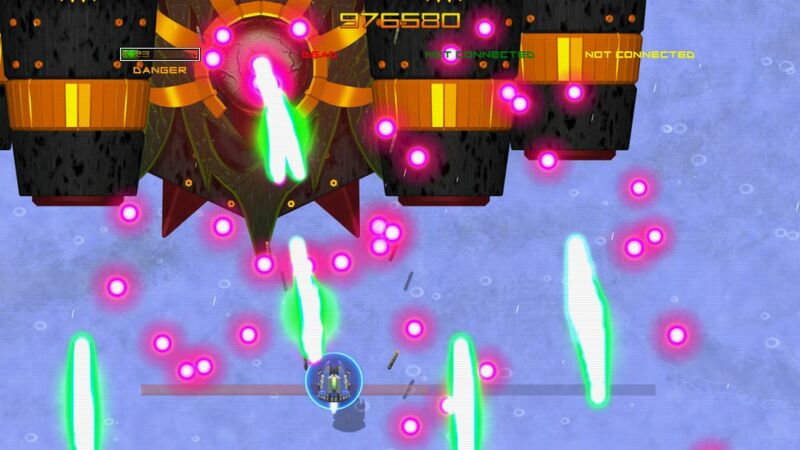 The idea is your ship can change colors at any time, allowing you to turn glowing orbs into different shades. A row of three or more vanishes, allowing you to keep flying.